Make your system as simple as possible. You are much more likely to keep up with it. Start from scratch. You will find it is much easier than trying to revamp your previous system. I don’t recommend purchasing a pre-designed filing system. It WON’T be simple. At least not for you. You will have to spend time fitting your categories into their categories. It is much easier to create your own categories, with titles that make sense to you. Opt for a system based on subjects rather than filling alphabetically. Filing alphabetically is way too much to remember. Is my VW Bug filed under V for Volkswagon, B for Bug, A for Auto or C for Car? It’s way too much for this pee brain to remember! If on the other hand, my filing system is separated into the 3 main subjects of Family, Personal, and Possessions and Finances, my car will be very easy to locate. Within the subject section Possessions, I will have a hanging file titled Automobiles. Within this hanging file I will have a manila folder for each of my Automobiles. Simple and easy to find! Locate your filing system in a place that is both convenient to use and located away from the hub of the home. Color–coding of your broad categories can reduce miss filing and stimulate your thinking. Again choose categories and colors that make sense to you! Straight-line filing, with the tabs one behind the other, is not only easier on the eye, but also simpler to maintain than alternating tab positions. After you complete your new filing system, make an outline or list of your system and use it until you are comfortable with it. Invest in a sturdy filing cabinet. Check out any office supply store. The choices are limitless. Consider where you will be doing your filing. Will you be in a home office where aesthetics are not an issue, or will your files be located in your family room for all to see? Will you need to roll it into a closet after use, or will it be a permanent fixture in your home? You can purchase a mobile file unit that can rolled into a closet or a basic 2 drawer metal cabinet for as little as $50. Or, you can purchase a furniture grade cabinet for as much as $500. You can even purchase individual file boxes, which can be stored on open shelving. Ultimately you need to remember that if they are not easy to access, they won’t be, and your filing won’t get done. Make sure you have plenty of uniform, sturdy hanging files and manila folders. As you are developing a new system, use post-it notes as labels until you have your entire system complete. Use 2 different colors; one representing your hanging files and the second representing your manila folders. This enables you to quickly and easily change category titles, and subject titles as your system evolves. 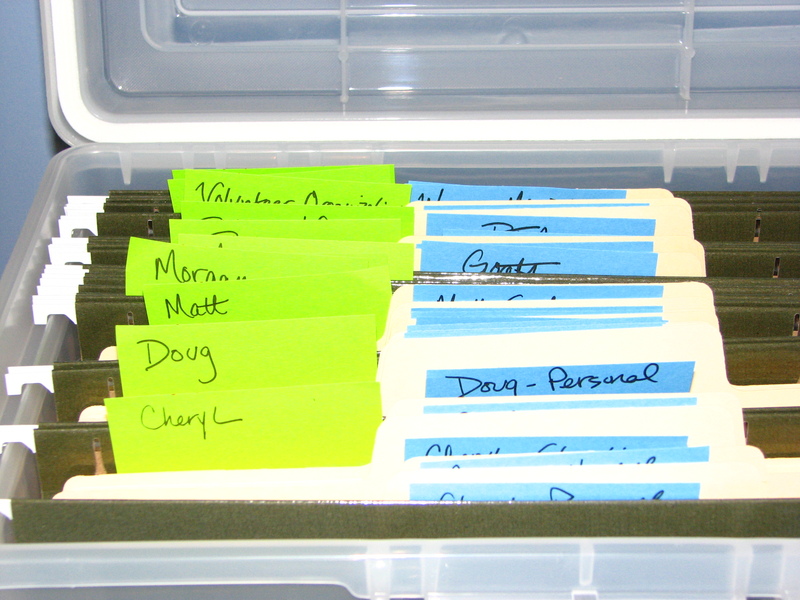 When your filing system is complete, take the time to clearly and neatly label your files. To label your hanging files, you can use the clear vinyl tabs included with them. I generally use 3 1/2 inch plastic tabs and label them with my brother label machine. This makes for easy to read and uniform labels. Alternatively, you can simply use a thin black marker to label your inserts. To label manila folders, I generally use inkjet/laser file folder labels, and print them from my computer. Again, this makes for easy to read and uniform labels. Alternatively, you can simply use a thin black marker to write on your file folder labels and then stick them on the manila folder or you can write directly on the folder. 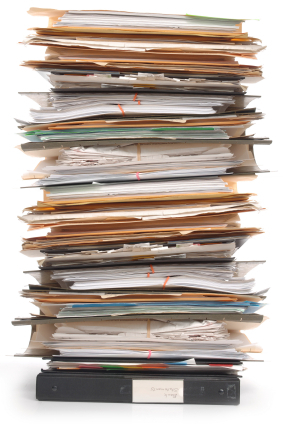 Remember, your filing system is dynamic and ever changing. 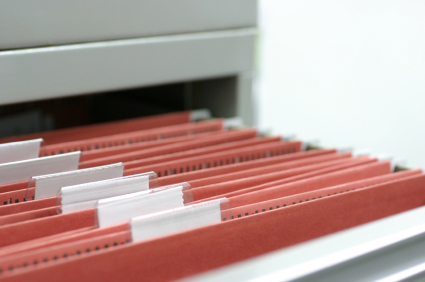 Your interests, responsibilities and possessions will change, and so should your filing system. Don’t be afraid to drop and add categories as your needs change. Set aside time each week or month to actually do your filing. Then set aside time each year to purge and revamp your system. Don’t forget to use a Document Retention Guide, available online, and check with your attorney and/or accountant while purging. Yes, setting up and maintaining a filing system takes a bit of work on the front end, but you will save yourself many hours of searching and much frustration in the long run. That, my friend, is priceless!